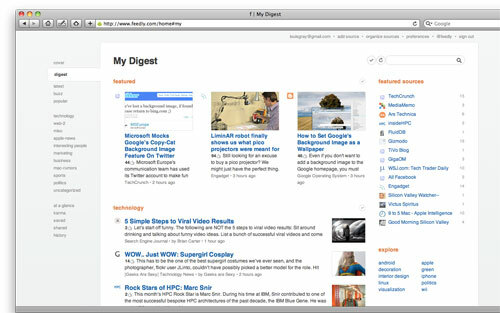 A week away from the service's second birthday, Feedly, the advanced RSS and news reader, displayed in a magazine-like format, finally made its way to my browser of choice, Safari. Having long required Firefox, and later supporting Google Chrome, through a browser extension, Apple's release of Safari 5, with support for browser extensions has brought Feedly to me. 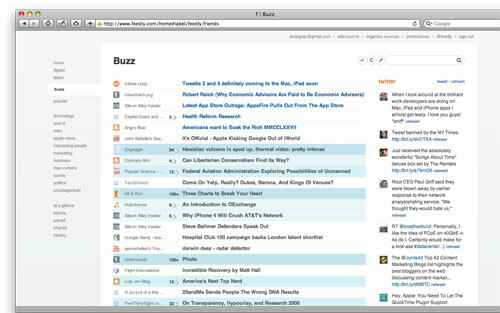 As I've mentioned several times, RSS, and Google Reader specifically, is my go to starting point for news discovery. As Google Reader and Google Buzz have grown in parallel, and in many ways merged, I am turning to Google's RSS-powered engines to bring me the best news from the Web and from my friends' recommendations, where we can engage in discussion around the news or simply say we "like" something. 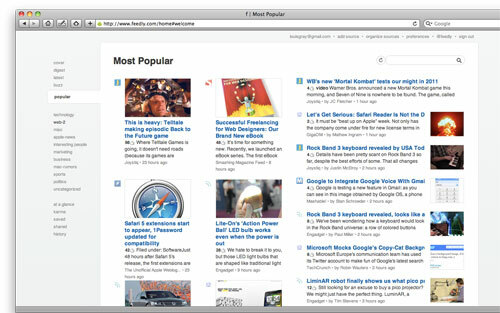 Feedly, one of the closest-working partners to Google Reader, and a strong user of their API, has innovated alongside the service's developments, adding in each of the new social elements as they debut. But for the most part, I just watched, because I am reticent to ditch Safari, which has all my customization, bookmarks, and history - plus synchronization to iPhone and iPad. With Apple rolling out Safari as part of their fleet of announcements at WWDC this week, Edwin Khodabakchian and his team took a couple days to spin up a Safari extension which provides the full Feedly experience - finally - in Apple's browser. While I am still not a huge fan of browser extensions, I am absolutely willing to sacrifice my ideals for such a long-anticipated, high quality, news discovery experience. Installing the Safari 5 extension is simple. Just download it - linked from the official Building Feedly blog, double click to install, and you're good to go.